Although it’s just the remains of the structure it’s still possible to visit the oldest brewery in Texas. The ruins of the historic Kriesche Brewery are located in the Monument Hill & Kreische Brewery State Historic Sites (a state park), in La Grange, Texas. Founded by German immigrant Heinrich Kreische, the brewery began brewing beer in the 1860’s. Originally a stonemason Kreische built an elaborate system of tunnels for his brewery, which sat on a spring fed creek. This allowed him to cool the fermenting room to temperatures as low as 40 degrees Farenheit. Pretty impressive considering electricity had yet to be invented. Along with the brewery he had his family home, a biergarten, and a dance floor. It must have been quite the place to visit in the 1860’s. This video from The Daytripper takes a great look at the complex. You can learn more about the brewery in this post from Beerhistory.com. We highly recommend a trip to La Grange and the Monument Hill & Kreische Brewery State Historic Sites. Admittance to the park is free of charge. Editor’s Note: The La Grange area along the Colorado River did receive dramatic flooding the week of August 28th, 2017. It may be best to wait until mid-September to visit the area and the park. Credit – TravellingOtter , no modifications. In Germany, Oktoberfest is celebrated annually in Munich from last week of September and first week of October. The first Oktoberfest began with a parade in 1810 to honor the marriage of Prince Ludwig and Therese of Saxe-Hildburghausen. Since then it has grown year-by-year and now more than 6 million people per year visit to celebrate the 16-18 day festival. If you can’t make the trek to the Theresienwiese this year, there will be plenty of Bavarian themed celebrations in Texas. Here are a few that we think you will find the most enjoyable throughout the fall. This traditional Oktoberfest in the heart of German-Texan territory is fun for the whole family. Expect oompah music, lots of food, a giant chicken dance, and even a 42 tournament. The festival takes place in the heart of downtown Fredricksburg on the Marktplatz. Be sure to take a stroll down main street while you are in Fredricksburg. Break out your dirndl and lederhosen for Austoberfest. Taking place at Shultz’s / The Austin Saengerrunde hall, this local Oktoberfest includes all you can eat sausage from a plethora of local sausage makers. The usually private choral and bowling club allows visitor through the doors for this yearly event. I had a good time when I attended a couple of years back. I advise getting their early to claim a spot and hopefully avoid the lines for beer and sausage. The festivities benefit Foodways Texas. Credit: Moresheth, Not Modifications. CC License. This is the grand-daddy of all Texas Oktoberfest and possibly the one of the best in the country. The Ten Day Salute to Sausage in New Bruanfels has everything a good Oktoberfest needs, great polka music, lots of sausage (wurst) and tons of Bier. The party takes place at the Wurstfest grounds in Landa Park on the banks of the Comal River. Stop by the Rotary booth in the middle of the food court for a plate of wurst and kartoffelpuffer (potato pancakes) before heading to the main hall with your pitcher to find a table to sit and enjoy the polka music. I highly recommend checking the schedule to see when Alex Meixner is playing, but there really aren’t any bad bands. All-in-all Wurstfest is a must for anyone who is a fan of all things Germanesque. So be sure to mark your calendar for a stop in New Braunfels during the early days of November (Friday before the first Sunday in Nov. through the 2nd Sunday in Nov.) The 2017 festivities run from Nov. 3rd through the 12th. Group tickets, and special discounts are available via the Wurstfest website. This is another great small Oktoberfest. It takes place at the German Free School just off of Red River in Austin. This small family friendly affair has lots of traditional German fun. Thursday and Sunday are Free! Located just south of the riverwalk in the historic King William District of downtown San Antonion Beethoven Maennerchor Hall is a historic choral club, with preservation of German culture as it’s primary purpose. I’ve never been to this Oktoberfest, but I have been to the hall. I think you can expect an authentic Oktoberfest with lots of nice people. Let’s face it, San Antonians know how to throw a great party. Houston’s Oktober fest takes place at Water Works on Buffalo Bayou. This is another one I have yet to attend. Judging from the website it looks like it is going to be a big party with lots of shenanigans. They also have lots of interesting competitions as part of their Oktoberfest Olympiad, including a stein race, barrel roll and brat toss. So get their early with a partner and sign up for the fun. Do you know of a great small town Oktoberfest that I shouldn’t miss? What Oktoberfests did we forget? We’ll add them to our list. This Article from the Texas State Historical Association does a much better job explaining the German population in Texas and how we got here than I could. With that being said this is a great map from the article. The map clearly shows the “German Belt” which the articles says stretches from Galveston to Hondo. Also there is also a speckling of German and northern European settlements throughout the state, excluding the border region. In the late 1830s German immigration to Texas was widely publicized in the Fatherland…. Their organization, variously called the Adelsverein, the Verein zum Schutze Deutscher Einwanderer in Texas, or the German Emigration Company, began work in the early 1840s… Between 1844 and 1847 more than 7,000 Germans reached the new land. Some of the immigrants perished in epidemics, many stayed in cities such as Galveston, Houston, and San Antonio, and others settled in the rugged Texas Hill Country to form the western end of the German Belt. The Adelsverein founded the towns of New Braunfels and Fredericksburg. Most of the German immigrant clusters came from west central Germany, particularly Nassau, southern Hanover, Brunswick, Hesse, and western Thuringia. At about the same time, another colonization project was launched. The Frenchman Henri Castro directed a project that moved more than 2,000 German-speaking settlers, mainly from clusters in the Upper Rhine Plain of Alsace, to Medina County, west of San Antonio. Castroville, founded in 1844, became the nucleus of the Alsatian colony, though many of the immigrants settled in San Antonio because of better economic opportunities there….The Germans were ambitious farmers and artisans who believed their futures were cramped by the social and economic system at home. They were not poverty-stricken and oppressed. Indeed, they were able to afford the substantial cash investment required in overseas migration. By 1850, when the organized projects ended, the German Belt in Texas was well established…After the Civil War ended, ships loaded with German immigrants once again unloaded at the Galveston wharves. From 1865 to the early 1890s, more Germans arrived in Texas than during the thirty years before the war. The number probably reached 40,000. Many of them settled in the rural areas and towns of the German Belt. Interestingly, the postbellum immigrants generally avoided the Hill Country. …By the 1880s German ethnic-islands dotted north central, northern, and western Texas. Ethnic islands failed to develop in East Texas, the Trans-Pecos, and the Rio Grande valley, however. As early as 1881, Germans founded the colony of Marienfeld (later Stanton) on the High Plains of West Texas. It was one of the first agricultural settlements in that part of the state. There the German settlers planted splendid vineyards, only to see them destroyed by drought. Most of the postbellum German colonies thrived, however…Since 1930 the extent of the German-settled area has changed very little, though a considerable post-World War II German immigration was directed to Texas cities. The Germans who settled Texas were diverse in many ways. 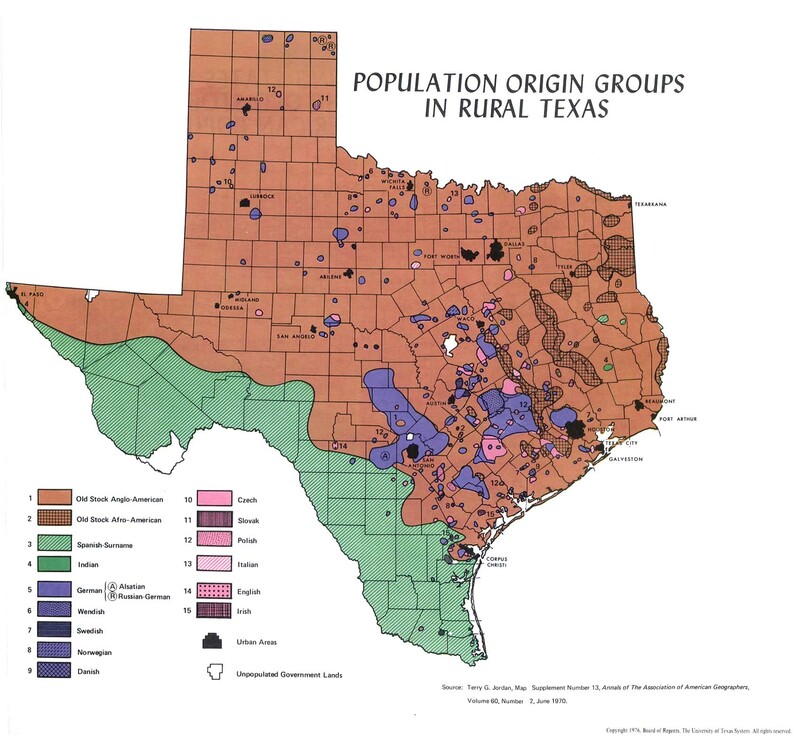 They included peasant farmers and intellectuals; Protestants, Catholics, Jews, and atheists; Prussians, Saxons, Hessians, and Alsatians; abolitionists and slaveowners; farmers and townsfolk; frugal, honest folk and ax murderers…The German settlements in Texas reflected their diversity. Even in the confined area of the Hill Country, each valley offered a different kind of German…The Llano valley had stern, teetotaling German Methodists, who renounced dancing and fraternal organizations; the Pedernales valley had fun-loving, hardworking Lutherans and Catholics who enjoyed drinking and dancing; and the Guadalupe valley had atheist Germans descended from intellectual political refugees…Because of their diversity, Texas Germans had a varied impact in achievements and influence in the state. They distinguished themselves in many professions and activities-Chester W. Nimitzqv in the military, Robert J. Klebergqv in ranching, Gustav Schleicher in politics, and Charles A. Schreiner in retail business. Many German settlements had distinctive architecture, foods, customs, religion, language, politics, and economy. In the Hill Country the settlers built half-timbered and stone houses, miles of rock fences, and grand Gothic churches with jagged towers reaching skyward. They spoke a distinctive German patois in the streets and stores, ate spiced sausage and sauerkraut in cafes, and drank such Texas German beers as Pearl and Shiner (see PEARL BREWING COMPANY, and SPOETZL BREWERY). They polkaed in countless dance halls, watched rifle competition at rural Schützenfeste, and witnessed the ancient Germanic custom of Easter Fires at Fredericksburg. Neat, prosperous farms and ranches occupied the countryside. There’s a lot of great information in this article. Obviously our German-Texan is rich with history and we will have many historical topics to come from. I didn’t know Kleberg was a German, so that opens up a wealth of stuff we can cover in regards to the King Ranch. It’s also interesting to see how the different river valleys of the hill country had different cultures. Obviously we will have to do tours of towns like Fredricksburg, New Braunfels, and Castroville, but where else should we go first? Which part of the state did your German ancestors settle in? What are some of you favorite German historical sites to visit? This page will feature content on history and our German heritage. As a Schleicher, I am a fifth generation German-Texan. My great-great-grandfather, Gustav Schleicher settled in Texas with a group settlers in 1847 and eventually settled in San Antonio. More on him in later posts. My step-brother Andrew Sorrell and his wife Roxanne (Reidel) also come from families with German heritage. Roxanne grew up in the German enclave of New Braunfels. Our whole family has a strong sense of pride for all things German and all things Texan and together we decided we wanted to share that admiration with others. Yes, we’re going to talk about Oktoberfest and bier, but we’re also going to share some of our favorite German themed day trips around the state, find the best schnitzel, German Sausage and pretzels in the state, let you know where to find good dirndl and lederhosen, and look at some of the history of German settlements throughout the state. Along with German things we also plan to cover anything originating from the German region of northern Europe, to include Czech, Austrian, French, Polish, Slav, Belgian, Swiss, Dutch, etc. That’s just a few of the subjects we plan to cover and we are open to your suggestions. Like a good German party we’re open to all kinds of kinds. So you don’t have to be German to be Germanesque. If you are interested in contributing or have a suggestion for something we should cover please feel contact us. You can contact us via the contact page, leaving a comment on the page, or by sending me an email to jschlik@gmail.com. We look forward to hearing from you and building Germanesque’s wealth of knowledge together and the experience. We hope you will enjoy our content, let us know when you take part in Germanesque activities, and shop with our sponsors and affiliates. Please share the site with your friends and family. Like any good afternoon polka, sausage, beir drinking session, the more the merrier. This page will cover all things outdoors. This is the place to come when you’re looking for hunting, fishing, hiking, camping, and what the best kind of Lederhosen to wear is. In the Beirgarten we will discuss all things beer and relaxing, including Oktoberfests, our favorite German restaurants, breweries, and German Bier.